Nationwide, the opioid epidemic killed more Americans in 2016 than the wars in Vietnam and Iraq combined. On October 26, 2017, President Donald Trump officially declared the opioid crisis a national public health emergency. The term opioid is used to refer to substances that act on the opioid receptors in the brain to create morphine-like effects. The opioid epidemic refers to the abuse of prescription pain medications as well as illegal street drugs like heroin. Often, people begin their addiction with prescription pain medication and progress to illegal street drugs when it becomes too difficult to obtain their pills by doctor shopping or borrowing from friends and family members. Prescription opioids play a vital role in managing chronic pain for people who suffer from serious medical conditions, but have a high potential for abuse when they are not taken precisely as prescribed. Many experts believe the opioid epidemic began in the late 1990s and early 2000s when doctors began shifting away from encouraging physical therapy, biofeedback, and exercise or meditation as the first response for pain management to writing prescriptions for opioids. Often, the patients who received these prescriptions were not fully aware of the risk for dependency and addiction until it was too late. 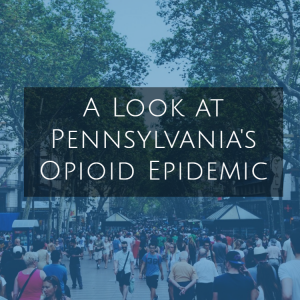 Prescription pain medications like Vicodin and OxyContin were responsible for 1,775 overdose admissions in the state of Pennsylvania, compared to the 1,524 admissions for heroin. However, hospital admissions for heroin overdose in Pennsylvania have quadrupled since 2010. Statistics for emergency room visits are not available, but these numbers are thought to be even higher. Opioid pain medication overdoses are most common among people age 50 and over, with 60% of admissions falling in this age group. In comparison, about 70% of the admissions for heroin overdoses were patients between 20 and 39 years old. Philadelphia admitted 47 per 100,000 residents, making it the center of the state’s opioid epidemic. However, rates in several other countries, including both rural Beaver and suburban Delaware, also topped 40 admissions per 100,000 residents. Fatal overdoses in Pennsylvania rose 37% from 2015 to 2016, with 13 people dying of an overdose each day. In total, 4,632 Pennsylvania residents lost their lives as victims of drug overdoses in 2016. This is nearly four times the number of residents who died as the result of fatal traffic accidents, with about 85% of the overdoses attributed to opioids. Fentanyl was found in about two-thirds of Pennsylvania drug fatalities in 2016, while heroin was found in about half. The overlap is due to the fact that many cases included victims who had taken both drugs. Fentanyl is often added to heroin, with or without the user’s knowledge. Governor Tom Wolf has made fighting the opioid epidemic a top priority of his administration. In the 2016 to 2017 state budget, he secured an overall total of $20.4 million to fight opioid abuse. These funds allowed DHS to create 45 Opioid Use Disorder Centers of Excellence to provide care for approximately 10,100 people who are currently unable to access treatment through other means. Expanded efforts have been made to provide access to naloxone, a medication designed to quickly reduce the effects of opioid overdose, for law enforcement, first responders, schools, and others who are likely to encounter overdose victims. Training for administering this vital medication is provided regularly at several locations throughout the state as well as in a convenient online course. To reduce the availability of prescription medications for potential misuse, the Department of Drug and Alcohol Programs, in partnership with the Pennsylvania Commission on Crime and Delinquency, the Office of the Attorney General, the National Guard, and the Pennsylvania District Attorneys Association, has implemented a prescription drug take-back box program with 580 take-back boxes across all 67 counties. In 2016, participation in the program allowed for the destruction of approximately 124,336 pounds of no longer needed prescription drugs. As the leading treatment and detox center in Pennsylvania, St. Joseph Institute is committed to providing Pennsylvania residents with the care they need to overcome opioid addiction. Our personalized treatment programs focus on healing the mind, body, and spirit–offering counseling, opportunities for spiritual development, and a chance to address co-occurring conditions like anxiety and depression as you prepare to take the first step towards a brighter future. Take medicaid insurance – offer this holistic treatment to those least fortunate!! What about the families that are put through Hell!!! My son chooses to use…. I just wait for the day that my hell will be over, because it is hell!!! I can’t even throw him out of my house without getting a lawyer and going through and eviction process.